Every now and then it's nice to try out "feel good about me" products and I have 2 of those to tell you about today. The first is BreastULTIMATE Breast Enlargement Pills. I have given birth to 4 children, who are all grown now, and breast fed all of them. Anyone who has done the same knows exactly what I'm talking about when I say it changes your breasts. My bras have gone from a 38EE nursing bra to a 36 Extra long haha. I have decided that gravity is no friend of mine. So I've been using these breast enlargement pills for about 2 weeks, I wasn't expecting a miracle by any means, and haven't seen a dramatic change but I have to say that my breasts feel a little fuller.That's what I'm hoping for is more fullness,not really larger. I know they will never look like they did before children and breast feeding, but just to have them look like real breasts again instead of an orange in a tube sock would be a great self - esteem boost haha. These capsules are all natural ingredients, no harsh chemicals, which makes me feel better about taking them. They contain Fenugreek Seed, Saw Palmetto Berries, Fennel Seed, L-Tyrosine, Wild Mexican Yam, Kelp,Damiana Leaves, Dong Quai Root, Mother's Wart, and Blessed Thistle. There a a few cautions that are labeled on the bottle such as, do not take if you are pregnant or nursing, or are under 18. Do not take if you are on prescription medications such as anti depressants or have known medical conditions like hyperthyroidism, high blood pressure, diabetes, or and heart diseases. I think with continued use the results will be even better than what I've seen already. I will have to let you all know. 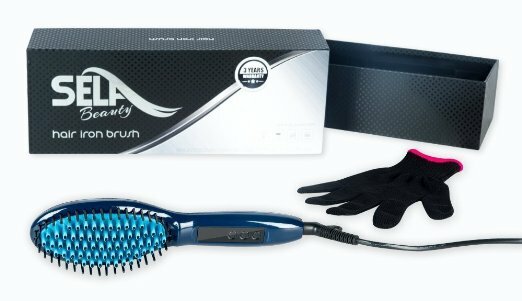 Second product I want to tell you about is the Hair Brush Straightener by Sela. My hair is fine but has a little bit of wave to it so it never lays quite how I want it to, so I was happy to try this brush straightener out. I see so many women who's hair looks so sleek and shiny and I've always envied them haha. Let me first say that I was surprised at how fast it heats up. There are several heat settings and they read in both Celsius and Fahrenheit. That I'm glad of because I'm not very good at converting one to the other. It also comes with a heat resistant glove, I'm assuming so you can use your other hand to assist with holding your hair against the bristles if needed. I didn't need to because my hair isn't very thick. It didn't take many passes through my hair and it was straight and laying like I've always wanted it to. YAY!!! It looks shiny and sleek, no more envy. So I decided to put this straightener to a real test. My daughter-in-law is biracial and has very thick, super curly and dry hair. I admit it took a few more passes through her hair than it did for mine but the results are stunning. Neither of us could believe how easy it is to use or how good the results are. It's so nice to find products that do what they say they'll do .